Wednesday afternoon I message my friend Ryan to see if he wanted to meet up for a movie in the park. He said yes and as luck would have it Wednesday was the only cool day of the week, yay for us! I opted to walk to the park since I've been keeping high impact activities minimal, and again so glad I did-I was met with the most beautiful sunset. The movie this week was "The Kids Are Alright." The movie was pretty good, I don't know if it was deserving of the oscar nomination for best picture, but not a bad way to spend the evening. Thursday I made it to the Neely's new restaurant in the city, Neely's Barbecue Parlor. Now while I hate to give a bad review, I was not won over. Granted my options were limited (side note for my long time readers but I am now eating poultry once again, see bottom of post for details) since I wasn't interested in pulled pork or ribs. I made reservations early in the week knowing the place would be busy, they have only been open for a week. After giving my name we waited a few minutes and were taken to our seats. At first I was very impressed with the decor. The interior was made up of several different rooms that were made up to appear like different houses. Very creative and I felt very much at home, actually I felt like I was at my grandmother's house, minus the shaky table we had, she wouldn't stand for a shaky table. The service was great as well, very hospitable, and pretty fast. I had already looked over the menu before coming so I was able to quickly order a glass of wine, the catfish appetizer, and a collard greens side. A few moments later we were brought cheese straws, water served in a mason jar (love that! ), and our drinks. The collard greens were pretty good, not great, but good, as was the catfish, but I could have left without the macaroni and cheese which I was able to grab a bit of to sample. It didn't do anything for me. As for the ribs, according to Ryan the rub was decent but a bit salty and he didn't feel like the meat was tender enough. We eyed over the dessert menu but decided to call it a night. After seeing a few raving reviews for the red velvet cake I wish I had shared a slice but the thought isn't enough to drive me back. I think NYC has enough other BBQ/southern spots that yield my attention. ***I made the decision to do so 2 weeks prior to my trip to Peru. I had 3 weeks were food options were going to be limited, in part because I was hiking 5 of the days and then again because I knew it was preferred that we ate with the children at the school I was volunteering and again I wasn't sure what would be served. Further my reason for cutting chicken out of my diet in the first place was due to farming practices in the United States. 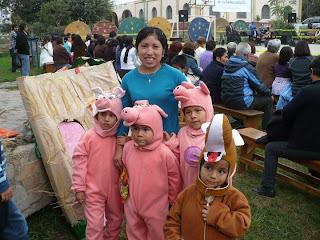 In Peru and particularly while at the school I knew where my meat was coming from (they raised the chickens at the school) and knew what they were and were not being fed (ie antibiotics). Since returning to New York I've continued to occasionally incorporate poultry into my diet, but it's always from a local source and organic. At restaurants I have kept to my pescetarian diet. Since I brought up Peru, what better time then now to show cute pictures of the boys from a recent school play.